Operators: Akkuratov E., Izvekov V.
A film about the week of sport in the city of Tolyatti. View of the Volga from the trees. View Togliatti from the opposite shore. People on the streets of Tolyatti. View of the factory buildings of the Volga Automobile Plant (now the "AvtoVAZ"). Workers assemble a new machine. Lounge dining room, covered tables. The meeting in the conference room of the plant with the newspaper "Soviet Sport". L.F.Trahtenberg, E.V.Zimin and among the guests of the enterprise. At the microphone chairman factory sports club A.M.Onischuk. Workers talk with journalists and athletes. Go down the street children. Detail of boxing competitions Championship junior sports school of Olympic reserve. Adults play football as part of the lottery prize "VAZ" among the shop teams. Hockey game at the Sports Palace between the teams of Togliatti and Saratov. In the streets of the town going triple and riders. Riders equestrian school 'VAZ ". Family members crews eco-rally "Tolyatti-89." Machinery alternately go on the route. Cars parties rally in the streets of the city. Bozunov BA - Deputy editor of the newspaper Soviet Sport. Zimin EV - Honored Master of Sports hockey, Honored Coach of the USSR, the world champion, Olympic champion. Trachtenberg LF - Sports journalist, the first spokesman of the USSR. Adults and children watching the athletes. Speaker athletic group of students of the school № 76. 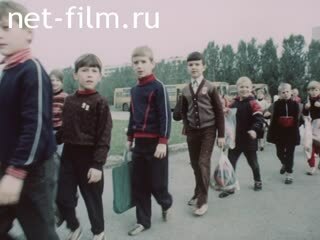 Children bring to school in Pool "VAZ". Children enter the building by the pool. Top view of the swimming lanes. The trainer works with children. Teaching children the basics of diving. Parents with children in the pool. Factory workers are engaged in the gym. Annual Run to the World Day of Engineering. In the run involving adults and children. A.P.Rogulin presents the prize to the winner. Start party autocross "Silver Boat". Alternation: says Deputy Director General "VAZ" V.I.Biryukov, stages of motor cross. Winners of the lottery: Lieutenant S.Tarasov and fitter "VAZ" Yu.E.Gordeev. Summing up the festival, view of the auditorium. Alternation: rewarding the winners of the competition, the audience's applause. Artist performs on the summer stage. Fire burns, people sit on the grass. Ragulin AP - Honored Master of Sports hockey, champion of the USSR, Europe and the world, the Olympic champion.